The Scout Association of Nicaragua is a fairly small but active association with at least one scout troop in many towns and cities in Nicaragua. They do not have an official website but use Facebook to communicate with their members. Their Facebook page is here and you can find their Wikipedia entry here. We have begun working with the Scouts and have visited the HQ in Managua various times and visited some local Scout troops on several occasions but are a long way from developing a working volunteer program. We have visited a couple of local troops and had a lot of fun getting involved with their meeting activities and games. We are hoping to create a lasting relationship with a local troop and assist at their meetings and provide support and skills that volunteers have to teach the scouts. The troops are not run exactly as they are in the US or Europe in that they are for both boys and girls and cover all ages in the same meeting. The format of the meetings is, however, very similar. There is a formal meeting at the beginning and end with the leader addressing the scouts and games and learning activities taking place for the majority of the meeting. The Scout Association was given 600 acres of land during the 1990's on the outskirts of Masaya. This land covers a small hill overlooking Masaya that has on it the fortress of Coyotepe. 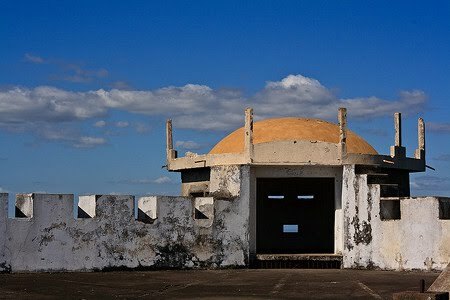 The fortress was built in the 1890's for the defense of Masaya. Later two levels of prisons cells were added and the fortress was used until it was abandoned in 1983 to incarcerate, torture, and execute political prisoners. The Scout Association owns and maintains this fortress, running tours around the two levels of prisons. They have plans to open a small museum on the grounds but do not have any definite idea what form the museum will take. We have spoken to the scout HQ regarding Coyotepe and there is scope for volunteer projects in the ongoing maintenance of the structure and grounds, assisting in the construction and maintenance of the museum, and providing English classes to the guides so they can guide in both languages. Also on the land given the Scout Association mentioned above is the national scout camping site: Campo Escuela. The campsite, although maintained, is always in need of additional assistance with the maintenance due to its size and lack of manpower. A volunteer project could be created here to assist in the maintenance of the site and any camps that take place there with the Scout Association.